We grew a crop of sweet potatoes this year that really surprised us. I had no expectations for the sweet potatoes and thought to myself that I’d figure it out as I went. I tend to learn by ‘doing’ when it comes to our garden. I make mistakes but I also learn to think outside the box. It’s nice to not always follow the leader. I did do what I was told in regard to buying the sweet potato plants and not rooting the tuber from the supermarket. 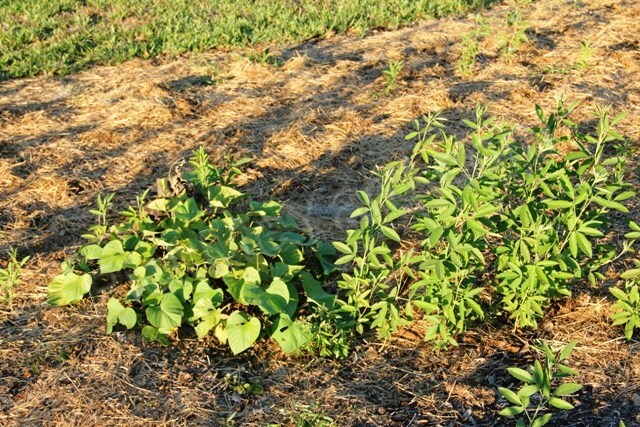 A tuber from the store is easy to root, but apparently it can carry disease into your soil. I’m certain this can happen any time you buy a little plant at the hardware store and plant it in your garden (especially with tomatoes). I chose not to take the risk with potatoes and purchased some little plants from a local edible nursery. The sweet potato starts were inexpensive but really tough to find. I started with a variety called ‘Boniato‘ several years ago. Now I’ve added several other varieties such as ‘Beauregard’ and ‘Tainung’. To be honest, I’m not sure which variety is growing where in our yard. Those labels are long gone. This isn’t a problem for our us though because our sweet potatoes are for our table not a market. 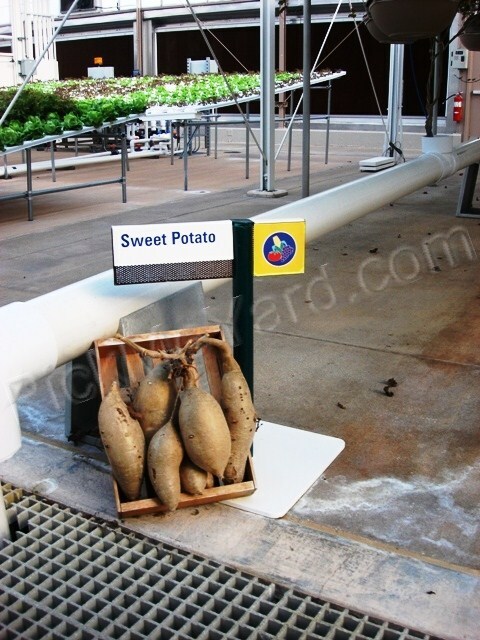 Hydroponincally grown sweet potatoes at The Land in Epcot, Disney World. 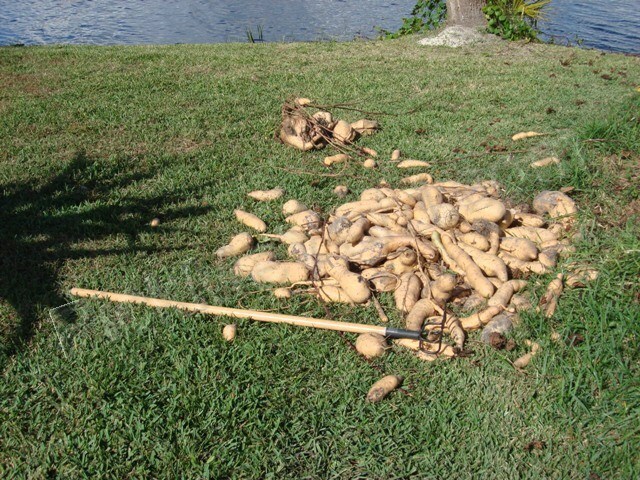 I harvested a huge amount of sweet potatoes this year and it was back-breaking work. These tubers were heavy and I had to dig and dig to find them. I learned the hard way that I should never throw the potatoes. They bruise easily and the bruise will turn into a rotten area. I tossed a few a little too hard, but didn’t do too much damage. Some of the tubers were gigantic. I wasn’t sure if this was a good thing and worried that I waited too long to harvest them (maybe way too long). My good friend Dr. Nune assured me that a larger sweet potato doesn’t mean it’s not tasty, just more of it to cook. A farmer friend told me that the larger potatoes are more difficult to sell at the market. Pick Me Yard's backyard sweet potato harvest. This huge sweet potato was growing in the middle of the crop. Grayson named the potato "It" after the brain in "A Wrinkle in Time" by Madeline L'Engle. 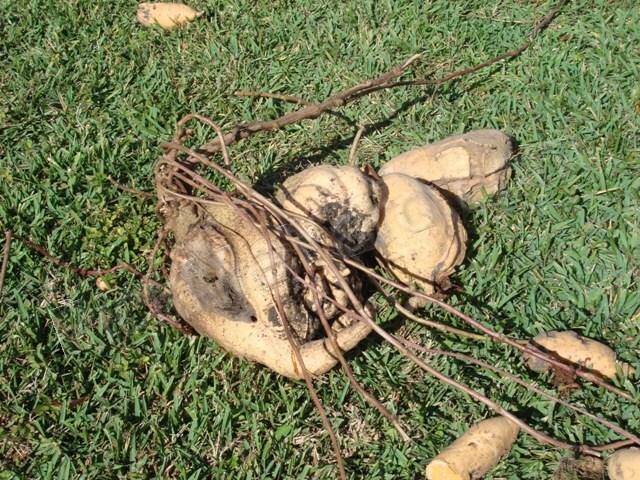 I was careful to keep my sweet potatoes from sitting in the sun while I was digging. 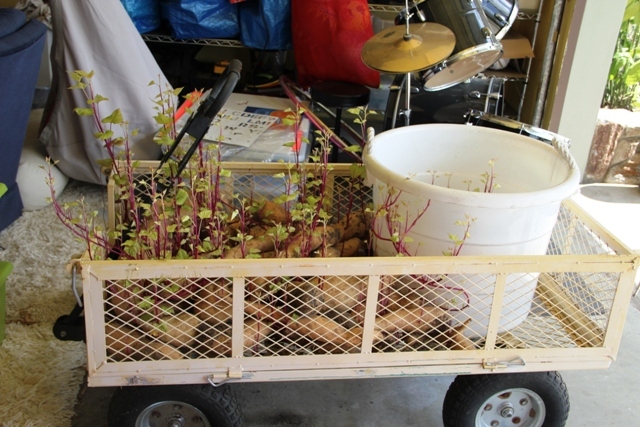 After I harvested my huge potatoes, I dragged the full and heavy wagon into my garage. I left them to cure for a few weeks. Then, I gave a bunch to Dr. Nune to be the taste tester. She called me a few days later and said, “have you given any of those sweet potatoes away?” I replied with a worried answer that I had not. “Good”, she said. “Let’s keep them only for us. 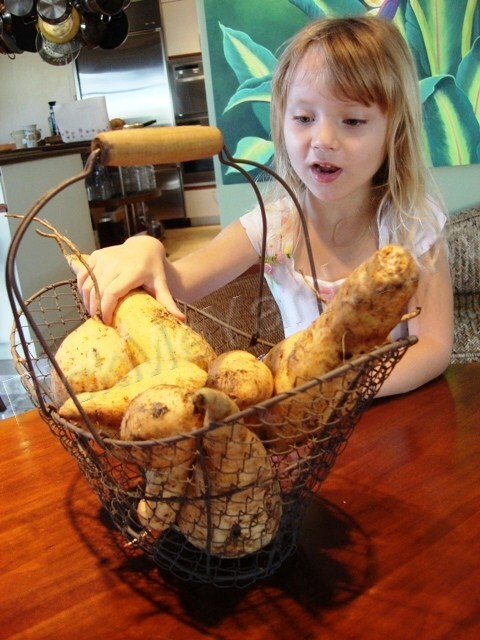 They are the best sweet potatoes I’ve ever had in my life”. She was right… they were. We had a endless supply of sweet potatoes to fill this basket for months. I thought I found every last tuber in the ground when I harvested. I worked really hard to get them all. Well, that was several months ago and I missed many, many tubers. The area has completely grown back again with sweet potato vines. This is a no-no in the gardening world because it invites the dreaded sweet potato pests and diseases. 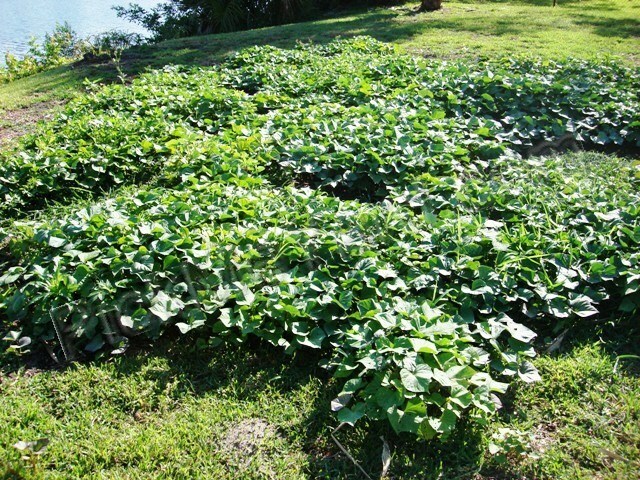 Click here for the latest on growing sweet potatoes in Southwest Florida as told by the University of Florida IFAS office. I’m going to harvest most of the greens in this patch for my goats. We’ll save a few for ourselves. Our 5-year-old was so excited that a garden was growing in our garage. These will all be replanted. They're the left-overs. 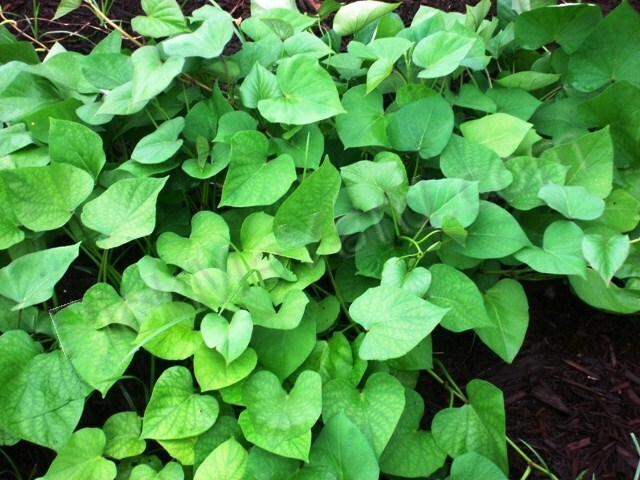 The sweet potato leaves are a delicious edible for the dinner table. Our friend Mama Do told us that steamed sweet potato leaves are a favorite in Vietnamese cuisine. One evening I was making dinner and realized I needed a vegetable. I remembered what Mama Do told us and I sent the kids out to cut a bowl of leaves. I steamed them on top of the chicken I was cooking and we have been huge fans of the leaves ever since! Even the kids loved them… probably because they picked them. Edible and yummy sweet potato leaves. These are heart-shaped. This year I have planted sweet potatoes all over our yard. There are patches everywhere and probably look like crop circles from an airplane. They grow great in our yard because of our sandy, Florida soil. I never water them and it hasn’t been a problem. They tend to crowd out most of the weeds and I just weed-wack around the edges of the big circle. They’re almost maintenance free in our yard. They also thrive in our hot, humid, sweltering summer. I’ve tried something new this summer and have planted some in an area with pigeon peas, sunflowers and calabaza pumpkins. I’m hoping it turns into a crazy mess of vines and little pigeon pea trees that crowd out all the weeds. It could be great or it could be a disaster. Either way, it’s an experiment and I’m growing most of this to feed to our lovely goats anyway. It’s our goat garden and I can either cut it for them or put their leashes on and lead them to it to clear it out. I’ll let you know how it turns out. This will continue to grow and fill in. By weed wacking the edges, it turns into a big circle. This is just a small section of the goat's garden. It will be interesting.